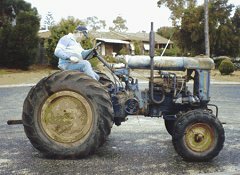 I'm Willie Young from Western Australia and I have just completed restoring "Theodore", a 1948 Fordson Major E27N. These were produced in Dagenham, England between 1945 and 1952 after the US and UK Fordson companies went their own ways and few were exported to the USA. The engine is a up-rated version of the Standard Fordson engine and the differential was changed from the worm drive to the differential as we know them today with crown wheel and pinion and longer kingpins were also fitted to the front axle, The petrol/kero engines had reached their limits by now and were subject to premature wear, but the English Perkins company tried fitting a 45HP P6 diesel which proved a winner. Some later models were fitted with the 50HP L4 engine which also proved well. 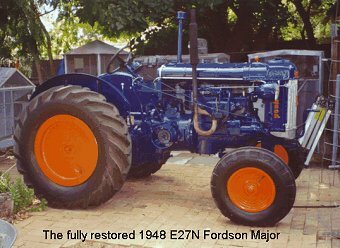 Actually Ford produced Fordson Majors right up to 1964. 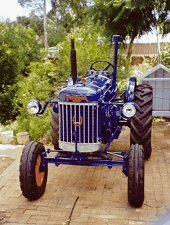 After the E27N they brought out the New Major in 1953 with a completely new diesel engine which probably set the standard for diesel tractor engines the world over. Then the Power Major followed in 1958 and then again by the Super Major in 1961. 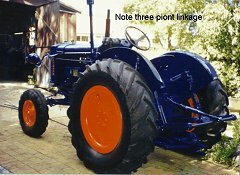 After this the numbered series came out and since then the British Fordson company has disappeared into a New Holland sort of conglomorate like so many other firms.